In women’s lacrosse, two yellow cards get you kicked out for the rest of the game. 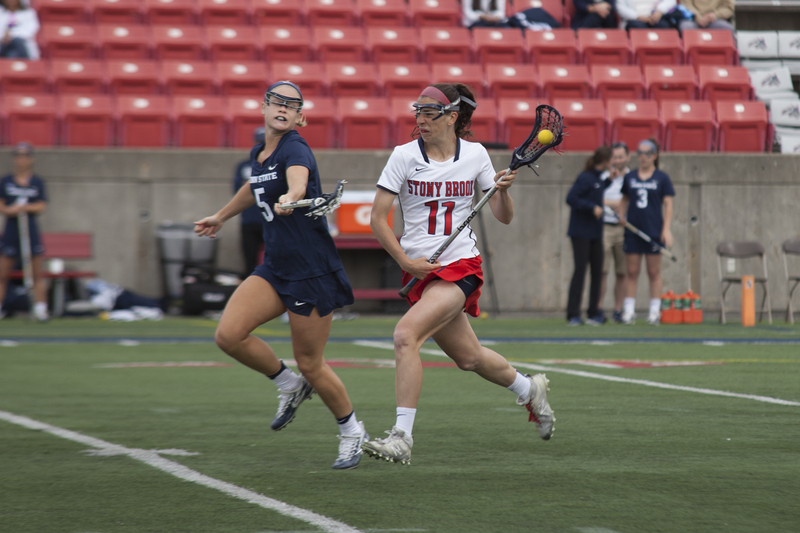 For the Stony Brook women’s lacrosse team, senior attacker Kylie Ohlmiller received her second yellow card and had to sit out the last 25 minutes of the game with her team up 13-7. However, her teammates and coaches didn’t fret when the best player on the team, possibly in the nation, was forced to sit. The Seawolves used an 8-0 first-half run and a 7-0 run in the second half to hold off the No. 16 Penn State Nittany Lions 21-13 Tuesday afternoon at Kenneth P. LaValle Stadium. Many Seawolves stepped up in the absence of Ohlmiller. Both redshirt-senior attacker Courtney Murphy and sophomore attacker Taryn Ohlmiller recorded a team-high eight points. Senior midfielder Samantha DiSalvo had a big day, scoring a career-high six goals with one assist for seven points. Junior midfielder Keri McCarthy scored three goals and had an assist, but her biggest accomplishment of the day came in the draw circle. She won 12 draws, with her second draw control of the day breaking the program record for most draw controls in a season that was also set by McCarthy last season. Taryn Ohlmiller took over her sister’s position after Kylie Ohlmiller got her second yellow card. The sophomore stood behind the net, waiting for her teammates to cut toward the goal. If no one was open, she would go to the net herself. She scored three goals and tied Kylie Ohlmiller with five assists on the day. This was the final ranked team Stony Brook will face until the NCAA tournament. Spallina saw this game as a final tune-up for the tournament, as this was the third game in nine contests that were against a non-America East opponent. Stony Brook will travel to Albany for the final game of the regular season. The winner of the game will get the No. 1 seed in the America East tournament and will host the conference tournament as well. The game is set for Saturday, April 28 at 12 p.m.